E-cigarettes contain some toxic chemicals and are not a safe alternative to smoking tobacco, US research suggests. In experiments on mice, scientists found that e-cigarette vapour could harm the lungs and make them more susceptible to respiratory infections. The PLOS One study also found traces of "free radical" toxins similar to those found in cigarette smoke. A lung charity said more research on the health impact of vaping was needed. 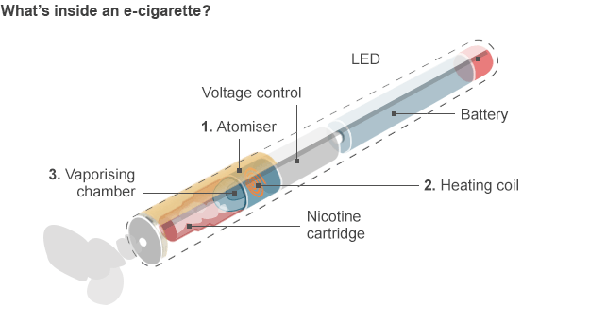 There has been debate over the safety of e-cigarettes since they were introduced. Although they are generally thought to be less harmful than smoking real cigarettes, because they contain no tobacco, they do still contain the addictive chemical nicotine. However, this study which looked at the effects of e-cigarette vapour on mice, says it still appeared to damage the lungs. Thomas Sussan, lead author and assistant scientist in the department of environmental health sciences at Johns Hopkins University, said: "E-cigarette vapour alone produced mild effects on the lungs, including inflammation and protein damage. "However, when this exposure was followed by a bacterial or viral infection, the harmful effects of e-cigarette exposure became even more pronounced." When the study divided mice into two groups and exposed one group to vapour from e-cigarettes for two weeks, it found that the mice in the exposed group were not as good at clearing the bacteria from their lungs. As a result, the viral infection led to them losing increasing amounts of weight, which in some cases killed the mice. This was because they had a compromised immune system and could not fight off the infection. The scientists said further research in people with a lung disease called chronic obstructive pulmonary disease (COPD) was needed to see how they were affected by switching from cigarettes to e-cigarettes. The study also discovered the presence of "free radicals" in e-cigarette vapour, although at 1% of the level found in real cigarettes. These free radicals are highly reactive toxins which can damage DNA or other molecules within cells, leading to cell death. Dr Sussan said he was surprised by the finding, considering the fact that e-cigarettes do not produce combustion products. "Granted, it's 100 times lower than cigarette smoke, but it's still a high number of free radicals that can potentially damage cells." Tom Pruen, chief scientific officer for ECITA, Electronic Cigarette Trade Industry Association, criticised the way the research was conducted. He said the mice were exposed to a vapour dose intended for humans, not mice. And the cartomisers in the e-cigarettes were not changed often enough in the study, which would expose the mice to "significant amounts of thermal degradation products". He added: "In reality, this research indicates that for people using the products as intended, e-cigarettes really do offer significant harm reduction compared with smoking, and appear to have a remarkably low toxic effect." Dr Penny Woods, chief executive of the British Lung Foundation, said: "While there is still little doubt that e-cigarettes are far less harmful than regular cigarettes, this study in mice is yet another reminder of the lack of conclusive evidence currently available on the long-term health impact of vaping in humans. She said more research should be conducted on e-cigarette use by people with COPD. "Quitting smoking is the most effective way in which someone living with COPD can slow the progression of their disease. "With as many as 25,000 people dying of smoking-related COPD in the UK each year, greater certainty is urgently needed over whether e-cigarettes are safe to use by COPD patients looking to quit smoking. "Among the wider population, we know many smokers have found e-cigarettes a useful aid to quitting. "However, until such time as more research has clarified the long-term health impact of vaping, we wouldn't advise their use by non-smokers."